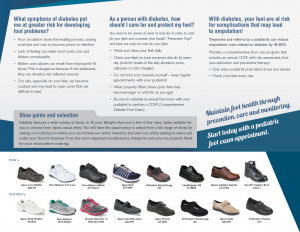 More than 75% of patients with diabetes and Medicare fit with shoes one year are not fit the next. This, despite annual coverage that offers podiatrists very reasonable reimbursement and that the American Diabetes Association recommends that patients be evaluated annually to determine their level of ulcerative risk. 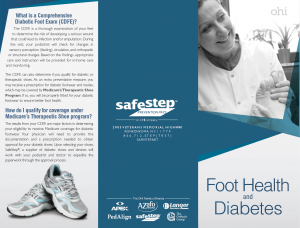 SafeStep has created a brochure for podiatrists to give to patients with Medicare and diabetes when scheduling an annual Comprehensive Diabetic Foot Exam. 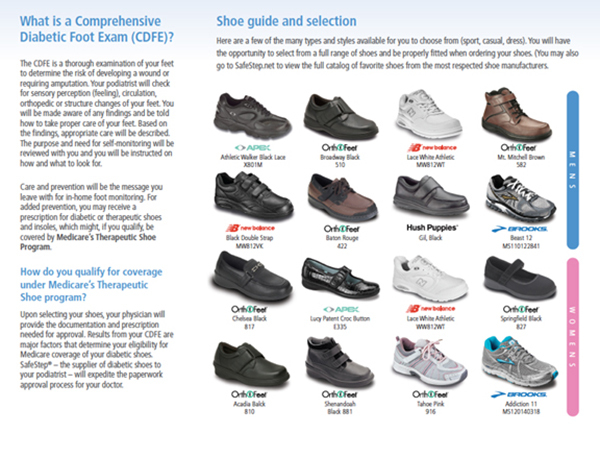 The brochure explains to patients the importance of the exam as well as qualifications for shoes under the Therapeutic Shoe Program. The brochure is available personalized with your practice name and address. Use as both an appointment reminder for patients’ CDFE and to explain to patients its importance. It includes at-home foot care tips. 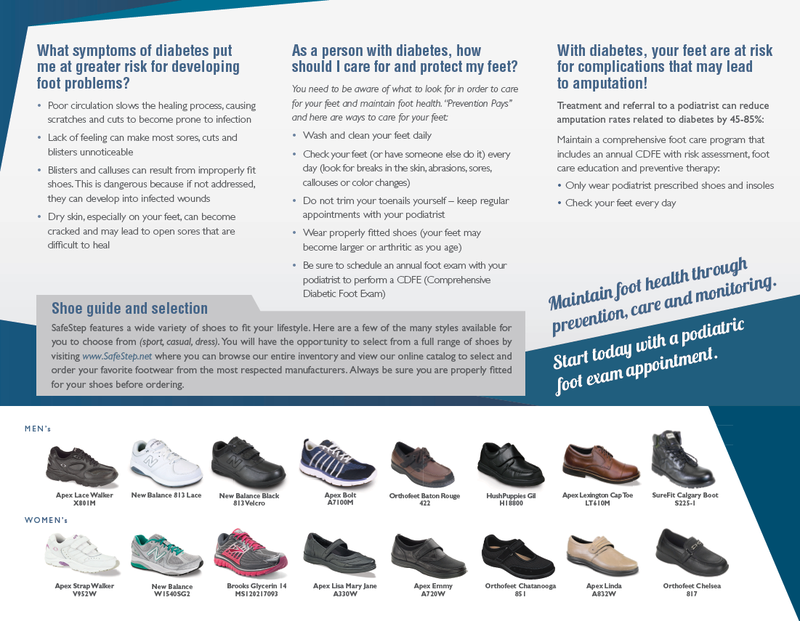 It also shows a preview of stylish athletic, dress or casual Medicare-covered diabetic shoes. Call 866.712.STEP (7837) to order free sample brochures. Also schedule a FREE Training Session with a SafeStep EXPERT to learn how to ensure that patients with diabetes, fit with shoes are, if qualified, fit year after year. Let us show you how to ensure that patients in need of care get it and also that your practice does not miss out on revenue opportunities. SafeStep DME Training will help you grow your practice, improve patient care and enhance practice revenue. The recommended risk classification adopted by the ADA is shown in the accompanying table. As would be expected, progressive levels of foot pathology are associated with increasing risk levels and associated categories. Although I do not agree with the terminology, Risk Category 0 includes those patients withoutevidence of loss of protective sensation (LOPS), peripheral arterial disease (PAD), or deformity. Nonetheless, I believe that any diabetic patient is potentially at risk for complications, including infection. Those in this category require only preventive education and annual CDFE. They do not generally require referral for specialist care due to their low risk for ulceration. Risk Category 1 includes those patients with neuropathy (LOPS) who may or may not have deformity. As a major risk factor for numerous lower extremity complications, neuropathy itself places the foot at risk. Accordingly, patients in this category should be seen every three to six months for examination and preventive foot care is required. Podiatrist (or other specialist) referral is warranted for such patients. Optimally, prescriptive diabetic footwear including multi-density insoles will be provided as part of a prevention strategy. If deformity is significant (very prominent hammertoes, for instance, with recurrent callus), consideration needs to be given to prophylactic corrective surgery – especially when deformity cannot be easily accommodated in therapeutic footwear commander du cialis sur internet. Take note that we recommended proactive surgical correction as necessary in our recommendations. Patients found to have PAD on examination (with or without LOPS) are assigned the next highest level of risk, that of Risk Category 2 . For obvious reasons, these persons require more frequent evaluation – especially in the presence of neuropathy – and referral to a vascular specialist for advice concerning any necessary diagnostic testing or therapeutic interventions. Such patients are routinely seen by specialists every two to three months for education, examination, preventive care, footwear therapy, etc. The rationale of more frequent visits is to allow for early intervention if new problems should arise. Diabetic patients with a prior history of ulceration, amputation, or Charcot foot are assigned to the high Risk Category 3 . It has been well established that persons with the aforementioned complications are at high risk for future development of ulceration and amputation. Accordingly, such persons require specialist care every one to two months to provide ongoing education, foot care, footwear provision and evaluation, as well as early intervention should new lesions arise. Vascular referral is, of course, required for ischemic complications. Inherent in this guide for ongoing preventive care is the principle that multidisciplinary cooperation is essential, using all necessary specialists to prevent the progression of established complications or to prevent limb loss when patients develop ulceration, infection, or gangrene. Screening your diabetic patients for lower extremity complications can be a critical step in overall care and can not only save limbs, but improve survival as well. Review the CDFE document referenced below as well as the other references so that you can become familiar with the common risk factors for ulceration and amputation. If not entirely preventable, early and appropriate intervention of new ulcers and infections is surely the best way to avoid lower extremity amputations in our high risk patients with diabetes. Pecoraro RE, Reiber GE, Burgess EM: Pathways to diabetic limb amputation: basis for prevention. Diabetes Care 1990; 13: 513-521. Reiber GE, Vileikyte L, Boyko EJ, et al. : Causal pathways for incident lower-extremity ulcers in patients with diabetes from two settings. Diabetes Care 1999; 22(1): 157-62. Frykberg RG, Zgonis T, Armstrong DG, et al. : Diabetic Foot Disorders: A Clinical Practice Guideline (2006 Revision). J Foot Ankle Surg 2006; 45(Suppl): S2-S66. American Diabetes Association: Consensus Development Conference on Diabetic Foot Wound Care. Diabetes Care 1999; 22(8): 1354. Boulton AJ, Armstrong DG, Albert SF, et al. 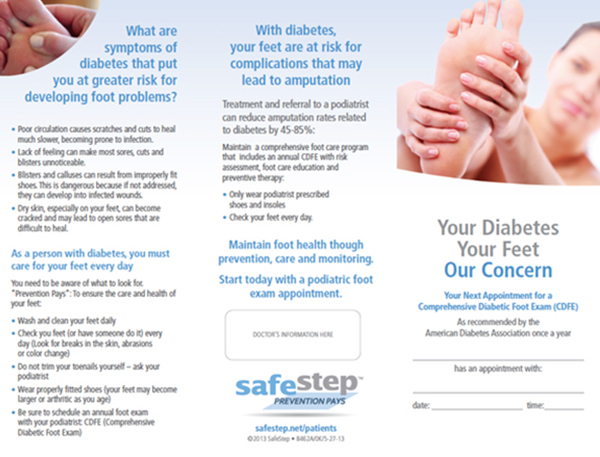 : Comprehensive foot examination and risk assessment: a report of the task force of the foot care interest group of the American Diabetes Association, with endorsement by the American Association of Clinical Endocrinologists. Diabetes Care 2008; 31(8): 1679-85.
International working group on the diabetic foot: International Consensus on the Diabetic Foot. In: Apelqvist J, Bakker K, Van Houtum WH, et al., eds., vol 2005. Maastricht: International Working Group on the Diabetic Foot, 1999. Apelqvist J, Bakker K, van Houtum WH, Nabuurs-Franssen MH, Schaper NC: International consensus and practical guidelines on the management and the prevention of the diabetic foot: International Working Group on the DiabeticnFoot. . Diabete Metab Res Rev 2000; 16 ((Suppl. 22. 1)): S84 –S92.